When we were young right through to our adult lives Eric Sykes was forever on the TV or Radio but what we did not realise was that he was also a radio, stage, television and film writer, actor, and director whose career spanned more than 50 years. He wrote for and/or performed with many leading comedy performers of the period, including Tony Hancock, Spike Milligan, Tommy Cooper, Peter Sellers and Johnny Speight. He first came to prominence through his many radio credits as a writer and actor in the 1950s, most notably through his collaboration on The Goon Show scripts. He became a TV star in his own right in the early 1960s when he appeared with Hattie Jacques in several popular BBC television series. Born 4th May 1923 in Oldham; his mother died three weeks later. He was the second child of his parents' marriage. His father was a labourer in a cotton mill and a former army sergeant. When Eric was two, his father remarried and he gained a half-brother named John. Educated at Ward Street Central School in Oldham, Eric joined the RAF during the War, qualifying as a wireless operator with the rank of Leading Aircraftman. His entertainment career began while serving in a Special Liaison Unit, where he met Flight Lieutenant Bill Fraser. He also collaborated with fellow RAF servicemen Denis Norden in the production of troop shows. Whilst preparing for one of these shows in 1945, he and Denis Norden went to a nearby prison camp in search of stage lighting; the camp turned out to be the Bergen-Belsen which had recently been liberated. They organised a food collection among their comrades to feed the starving inmates. When the war ended he decided to try his luck in London, arriving in the middle of the coldest winter in living memory (1946–47). He rented lodgings, expecting to find work quickly by the end of the first week he was cold, hungry, and penniless. The turning point came on the Friday night of this first week when he had a chance meeting with Bill Fraser, who was featuring in a comedy at the Playhouse Theatre. He took the impoverished Eric to the theatre, offered him food and drink, and then asked if he would like to write for him. Eric began providing scripts for both Bill Fraser and Frankie Howerd and soon found himself in demand as a writer. He worked on Educating Archie from 1950, and also Variety Bandbox. Working on Educating Archie led to him to meet Hattie Jacques for the first time. His writing career had begun in 1948 but from the early 1950s he began to make a transition from radio to TV, writing one-off shows including The Howerd Crowd (1952), Frankie Howerd's Korean Party, Nuts in May, and The Frankie Howerd Show as well as The Big Man (1954) starring Fred Emney. He also made his first screen appearance in the film Orders Are Orders (1954), which also featured Sid James, Tony Hancock, Peter Sellers, Bill Fraser, and Donald Pleasence. He shared a small office above a grocer's shop in Shepherd's Bush with Spike Milligan. Late in 1954 they began collaborating on scripts for The Goon Show, their first script was for a Goon Show special called Archie in Goonland, a crossover between The Goon Show and Educating Archie. The special was broadcast in June 1954 and featured the regular Goon Show cast plus Peter Brough and Archie Andrews and Hattie Jacques. It was not a success and neither a recording nor the script has survived. In 1955 Eric Sykes wrote and performed in a BBC Christmas spectacular, a spoof pantomime called Pantomania, which featured many well-known personalities of the era. That same year he signed a contract as scriptwriter and variety show presenter for the newly formed ATV, while continuing to write and perform for the BBC. In 1956 he performed, wrote and acted as script editor for Rediffusion’s TV comedy The Idiot Weekly, Price 2d, trying to translate the humour of the Goons to television. 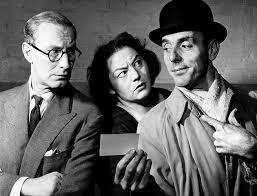 It starred Peter Sellers, with Eric Sykes, Kenneth Connor, and Valentine Dyall. During this year he also made his second film, playing a minor role in the Max Bygraves film Charley Moon, which also featured Bill Fraser, Peter Jones, Dennis Price, and child actress Jane Asher. During 1956–57, he also wrote for and performed in The Tony Hancock Show, where he again worked with Hattie Jacques. By this time he had developed hearing problems; he subsequently lost most of his hearing, but learned to lip-read and watch other performers. In 1959 he wrote and directed the BBC special Gala Opening, with a cast that included 'Professor' Stanley Unwin and Hattie Jacques and he had a role in the Tommy Steele film Tommy the Toreador. 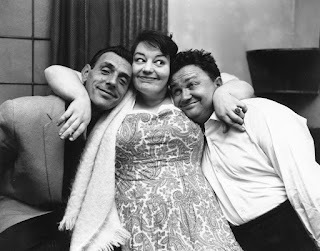 In the 1960s Eric Sykes and his old friend Hattie Jacques co-starred in a new 30-minute BBC TV sitcom, Sykes and a..., created with Johnny Speight. The original concept had Eric living with his wife, with simple plots centring on everyday problems, but he soon realised that by changing the house-mate from wife to sister it offered more scope for storylines. In the revised concept Eric Sykes lived at 24 Sebastopol Terrace, East Acton, with his unmarried twin sister Harriet, played by Hattie Jacques. The other regular cast members were Deryck Guyler as local constable "Corky" Turnbull and Richard Wattis as their snobbish, busybody neighbour Charles Brown. Nine short seasons of Sykes and A... were made between 1960 and 1965, ranging between six and nine episodes plus a short 1962 special in the BBC's annual Christmas Night with the Stars programme. Twenty-five of the original fifty-nine episodes of Sykes and A… have survived in the BBC archives. It was during this series that he introduced one of his best known creations, the wordless slapstick film The Plank. In 1962 he played his first starring film role in Village of Daughters featuring a mostly British cast including John Le Mesurier (who was married to Hattie Jacques). During 1965, he made what proved to be the final series of Sykes and A... and appeared in three major films. In 1967 he and his old comrade Jimmy Edwards started touring with the farce Big Bad Mouse and they would return to this on and off until 1975. 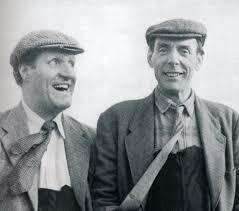 Returning to television, Eric and Hattie appeared in the 1967 special Sykes Versus ITV with Tommy Cooper. In 1969 he starred with Spike Milligan in Curry and Chips, the series provoked a storm of complaints about its use of racist epithets and bad language (although Eric refused to swear, as he did throughout his career). It was cancelled after six episodes. In 1972, seven years after the cancellation of Sykes and A..., the BBC revived the series under the title Sykes. Sixty-eight colour episodes of Sykes were made between 1972 forty-three of the shows were re-workings of scripts from the 1960s series. The third version of The Plank was made in 1979 for Thames TV as a half-hour TV special. Eric was the subject of Thames Television's This Is Your Life, broadcast on 25th December 1979. In the 1980s he wrote and appeared in a remake of his 1969 short film Rhubarb which featured Jimmy Edwards, Bob Todd, Charlie Drake, Bill Fraser, Roy Kinnear, Beryl Reid, and Norman Rossington. It was his last screen appearance with Hattie Jacques. In 1985 he played the Mad Hatter in the Anglia Television adaptation of Alice in Wonderland, with Michael Bentine, Leslie Crowther, and Leonard Rossiter.. He toured Australia with Run for Your Wife (1987–88) with a cast that included Jack Smethurst and David McCallum. In 1989 in his first series since the Sykes series ended he starred as the secretary in the comedy The Nineteenth Hole it was not a success and ran for only one series. From March 1997 together with Tim Whitnall, Toyah Willcox, and Mark Heenehan, he provided narration for the Teletubbies. It is his voice that announces "Teletubbies!" during the title sequence. In 2000 he appeared in Gormenghast and in 2001 he had one of his few serious screen roles, playing a servant in the thriller film The Others, also in 2005 he played Frank Bryce in Harry Potter and The Goblet of Fire. Two years later he appeared in Last of the Summer Wine and in New Tricks, as well as My Family. He became partially deaf as an adult. His hearing started to deteriorate in the War and he had an operation in 1952 followed by another two years later. Recovering from the second procedure he discovered he was profoundly deaf. His spectacles contained no lenses but were a bone-conducting hearing aid. Disciform macular degeneration, brought about by age and possibly smoking, left him partially sighted, and he was registered as blind. He had stopped smoking cigarettes in November 1966, but continued to smoke cigars until 1998. He underwent quadruple heart bypass surgery in 1997 and suffered a stroke in 2002. He married Edith Eleanore Milbrandt on 14th February 1952 and they had four children, Catherine, Julie, Susan and David. In the year he died they marked their 60th wedding anniversary. He was appointed OBE in 1986 and in the 2005 was promoted to CBE. He died on the morning of 4th July 2012, aged 89, at his home in Esher after a short illness, his family was with him when he died. He has a memorial plaque in St Paul's Church in Covent Garden. On 20/05/1960 the number one single was Cathy's Clown - Everly Brothers and the number one album was South Pacific Soundtrack. The top rated TV show was Royal Variety Performance (ATV) and the box office smash was Psycho. A pound of today's money was worth £13.68 and Burnley were on the way to becoming the Season's Division 1 champions. On 20/05/1961 the number one single was On the Rebound - Floyd Cramer and the number one album was GI Blues - Elvis Presley. The top rated TV show was Bootsie & Snudge (Granada) and the box office smash was One Hundred and One Dalmations. A pound of today's money was worth £13.25 and Tottenham Hotspur were on the way to becoming the Season's Division 1 champions. On 20/05/1962 the number one single was Nut Rocker - B Bumble & the Stingers and the number one album was Blue Hawaii - Elvis Presley. The top rated TV show was Coronation Street (Granada) and the box office smash was Lawrence of Arabia. A pound of today's money was worth £12.89 and Ipswich Town were on the way to becoming the Season's Division 1 champions. The big news story of the day was Marilyn Monroe sings Happy Birthday for JFK. On 20/05/1963 the number one single was From Me To You - The Beatles and the number one album was Please Please Me - The Beatles. The top rated TV show was Liberal Party Political Broadcast (all channels) and the box office smash was The Great Escape. A pound of today's money was worth £12.64 and Everton were on the way to becoming the Season's Division 1 champions. On 20/05/1964 the number one single was Don't Throw Your Love Away - Searchers and the number one album was Rolling Stones - The Rolling Stones. The top rated TV show was Coronation Street (Granada) and the box office smash was Dr Strangelove. A pound of today's money was worth £12.24 and Liverpool were on the way to becoming the Season's Division 1 champions.The big news story of the day was Microphones found in Moscow's US Embassy.